Cincinnati, Ohio — StriveTogether announced today the receipt of a three-year, $300,000 grant from The Draper Richards Kaplan Foundation (DRKF) to support nationwide collective impact work in the education sector. The new funds will contribute to StriveTogether’s general operating expenses and help grow the organization to support to the national Cradle to Career Network’s continued work to improve education outcomes for students across the country. In addition to the grant money, DRKF Managing Director Tom Fry will join StriveTogether’s national advisory board for a three-year term, providing ongoing insight to help the organization grow. Edmondson will also join the DRKF Portfolio of Social Entrepreneurs. The Draper Richards Kaplan Foundation employs a venture capital model of investment to support visionary social entrepreneurs who generate sustainable impact at a large scale. 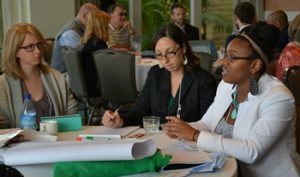 The Foundation finds nonprofits led by extraordinary social entrepreneurs with high impact models, funds those early stage nonprofit organizations with $300,000 over three years and supports their growth and impact by serving as a board member and creating a learning community for the nonprofit leaders.